In the post Improving On assertEquals with JUnit and Hamcrest, I briefly discussed Hamcrest "core" matchers being "baked in" with modern versions of JUnit. In that post, I focused particularly on use of JUnit's assertThat(T, Matcher) static method coupled with the Hamcrest core is() matcher that is automatically included in later versions of JUnit. In this post, I look at additional Hamcrest "core" matchers that are bundled with recent versions of JUnit. In my previous post demonstrating the Hamcrest is() matcher used in conjunction with JUnit's assertThat(), I used an IntegerArithmetic implementation as test fodder. I'll use that again here for demonstrating some of the other Hamcrest core matchers. For convenience, that class is reproduced below. * Simple class supporting integer arithmetic. * Provide the product of the provided integers. * @param firstInteger First integer to be multiplied. 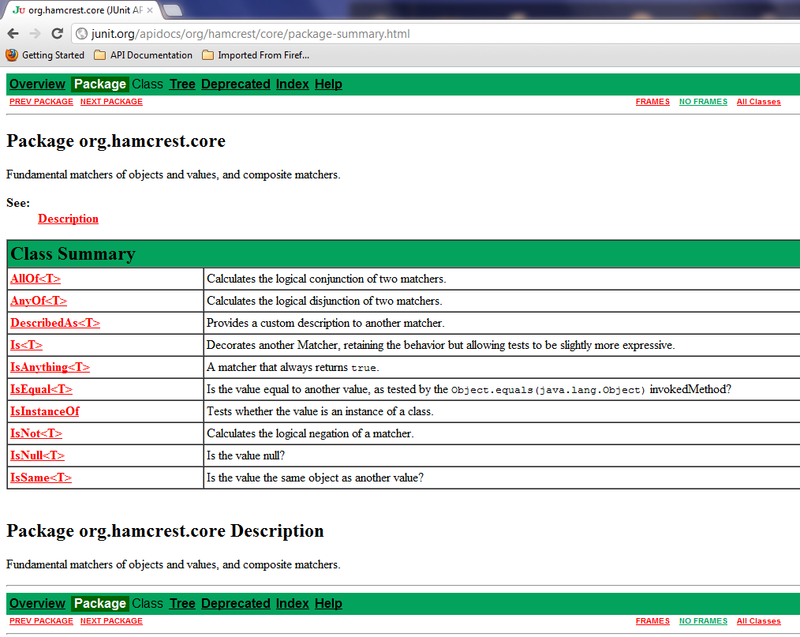 * @param secondInteger Second integer to be multiplied. * @param integers Integers to be multiplied together for a product. 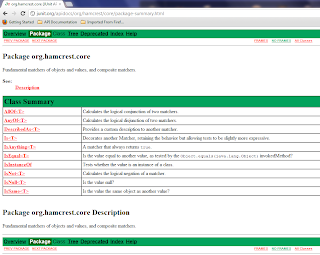 * @return Product of the provided integers. *     to be properly represented by a Java integer. In the Improving On assertEquals with JUnit and Hamcrest post, I relied largely on is() to compare expected results to actual results for the integer multiplication being tested. Another option would have been to use the equalTo matcher as shown in the next code listing. Although not necessary, some developers like to use is and equalTo together because it feels more fluent to them. This is the very reason for is's existence: to make use of other matchers more fluent. I often use is() by itself (implying equalTo()) as discussed in Improving On assertEquals with JUnit and Hamcrest. The next example demonstrates using is() matcher in conjunction with the equalTo matcher. * Hamcrest matcher equalTo with "is" Matcher.. The equalTo Hamcrest matcher performs a comparison similar to calling Object.equals(Object). Indeed, its comparison functionality relies on use of the underlying object's equals(Object) implementation. This means that the last two examples will pass because the numbers being compared are logically equivalent. When one wants to ensure an even greater identity equality (actually the same objects and not just the same logical content), one can use the Hamcrest sameInstance matcher as shown in the next code listing. The not matcher is also applied because the assertion will be true and the test will pass only with the "not" in place because the expected and actual results happen to NOT be the same instances! * Hamcrest matchers not and sameInstance. It is sometimes desirable to control the text that is output from an assertion of a failed unit test. JUnit includes the core Hamcrest matcher asDescribed() to support this. 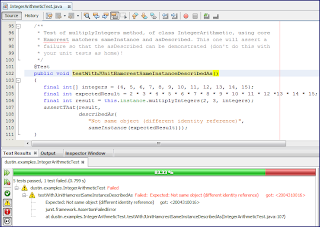 A code example of this is shown in the next listing and the output of that failed test (and corresponding assertion) is shown in the screen snapshot of the NetBeans IDE that follows the code listing. * your unit tests as home)! Use of describedAs() allowed the reporting of a more meaningful message when the associated unit test assertion failed. I am going to now use another contrived class to help illustrate additional core Hamcrest matchers available with recent versions of JUnit. This that "needs testing" is shown next. * supplied SetType that indicates desired type of Set implementation. * that has a generic parameterized type of that specified. * @param setType Type of Set implementation to be used. * @param parameterizedType Generic parameterized type for the new set. *    but the provided parameterizedType is not an Enum. "Provided SetType of ENUM being supplied with "
+ "parameterized type that is not an enum ["
The contrived class whose code was just shown provides opportunities to use additional Hamcrest "core" matchers. As described above, it's possible to use all of these matches with the is matcher to improve fluency of the statement. Two useful "core" matchers are nullValue() and notNullValue(), both of which are demonstrated in the next JUnit-based code listing (and is is used in conjunction in one case). * Test of createSet method, of class SetFactory, with null SetType passed. The Hamcrest matcher instanceOf is also useful and is demonstrated in the next code listing (one example using instanceOf by itself and one example using it in conjunction with is). Many of the Hamcrest core matchers covered so far increase fluency and readability, but I like the next two for even more reasons. The Hamcrest hasItem() matcher checks for the existence of the prescribed item in the collection and the even more useful Hamcrest hasItems() matcher checks for the existence of multiple prescribed items in the collection. It is easier to see this in code and the following code demonstrates these in action. It is sometimes desirable to test the result of a certain tested method to ensure that it meets a wide variety of expectations. This is where the Hamcrest allOf matcher comes in handy. This matcher ensures that all conditions (expressed themselves as matchers) are true. This is illustrated in the following code listing, which tests with a single assert that a generated Set is not null, has two specific Strings in it, and is an instance of TreeSet. To demonstrate the Hamcrest core "anyOf" matcher provided out-of-the-box with newer versions of JUnit, I am going to use yet another ridiculously contrived Java class that is in need of a unit test. * Provide what day of the week today is. * Provide the day of the week of today's date. *    static fields defined in Calendar class. Now I need to test that the sole method in the class above returns a valid integer representing a day of the week correctly. I'd like my test(s) to ensure that a valid integer representing a day Sunday through Saturday is returned, but the method being tested is such that it may not be the same day of the week returned on any given test run. The code listing below indicates how this can be tested with the JUnit-included Hamcrest "anyOf" matcher. * Test of getTodayDayOfWeek method, of class Today. While Hamcrest's allOf requires all conditions to match for the assertion to be avoided, the existence of any one condition is sufficient to ensure that anyOf doesn't lead to an assertion of a failure. My favorite way of determining which core Hamcrest matchers are available with JUnit is to use import completion in my Java IDE. When I statically import the org.hamcrest.CoreMatchers. * package contents, all of the available matchers are displayed. 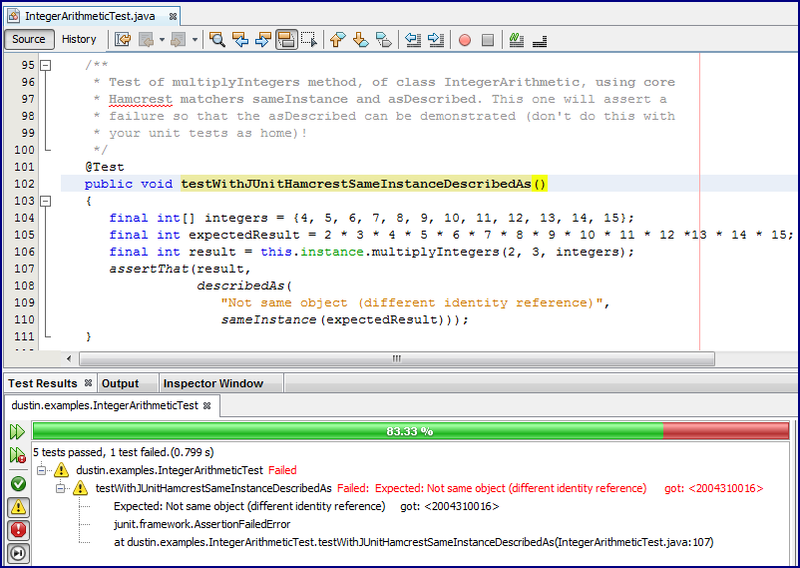 I can look in the IDE to see what the * represents to see what matchers are available to me. It is nice to have Hamcrest "core" matchers included with JUnit and this post has attempted to demonstrate the majority of these. Hamcrest offers many useful matchers outside of the "core" that are useful as well. More details on these are available in the Hamcrest Tutorial.